The next R-12 event is scheduled for February 5. However, given the current road conditions and upcoming winter storm, there's a very good chance that we'll need to reschedule this event. Road conditions permitting, we'll be running a new version of the "Beyond Hope to New Hope" course -- a new cuesheet and map were posted this weekend. ***Please note the new start/finish location at the Belvidere Diner***. The new routing mainly uses primary roads, since these have the best chance of being cleared and salted, given all the snow we've gotten in the past month. But despite that effort, road conditions were not good enough this past weekend to run a volunteer preride. Please be sure to check back on the website and message board later in the week for updates. Looking for information on PBP? RUSA advises that the ACP should be the primary source for information. You can learn much at the 2011 PBP Website. RUSA has provided a few highlights aimed to make the ride experience in 2011 more enjoyable. RUSA will not be involved in rider registration as it has been in the past, so riders should be very, very familiar with the registration information - http://www.paris-brest-paris.org/pbp2011/index2.php?lang=en&cat=inscription&page=comment_sinscrire - as well as the rules of the event - http://www.paris-brest-paris.org/pbp2011/index2.php?lang=en&cat=randonnee&page=reglement - and other information on the site. For the Facebook users, the ACP is also communicating to PBP participants through the PBP Facebook Page. As in previous editions, the bike check will make sure that your bike is in accordance with the rules and enable you to fix last-minute problems. After the bike check, you will pick up your brevet card as well as the various ordered items (jersey, reflective vest, meals, etc.). In 2011, those who start at 5:00 a.m. will be accommodated by a bike check and brevet card collection for them alone on Sunday morning. This way, they can avoid spending two nights there before the start. All other riders will have their bike check on the day before, Saturday, August 20. The Paris-Brest-Paris Randonneur is a great opportunity to celebrate and to have a good time all together. That's why we invite you to meet on Saturday evening for a party which will end with fireworks around the 'gymnase des Oroits de I'Homme'. Since 1991, the Audax Club Parisien donates a part of the Paris-Brest-Paris Randonneur revenues to charity. This year the ACP chose to help the 'Institut Curie' to fund cancer research. You are invited to join with your own contribution. You will find several links to the 'Institut Curie' on the ACP website. The first riders will start Sunday, August 21 at 4:00 p.m. The last ones are expected to leave around 8:00 p.m. This should enable riders to ride further before the first overnight stop on Monday evening. The hope is to avoid further overcrowding at the Loudeac control. In addition to the traditional group starts, free starting times are offered on Sunday evening from 09h00 to 10h00 p.m. and on Monday morning from 5:30 to 8:00 a.m.
No crowds, no stress, riders will simply validate their brevet cards, cross the starting line, and begin the randonnee. But beware, only small groups of less than 20 people will be allowed to start at once, and if there is too much demand restrictions will be imposed. Of course, riders will immediately be riding in the flow of traffic and thus riders are urged to be vigilant from the very beginning. In 2011, the registration process is simplified: only offer online registration is offered the PBP website (www.paris-brest-paris.org) with integrated payment. Riders no longer have to send any documents by mail. No more long lines at the controls to validate both brevet card and magnetic badge! The organization will still use the brevet card to document that riders passed through the various controls, but rider passage will be automatically recorded with a magnetic chip carried across a mat on the floor. At the end of the ride, riders can keep the chip as memory. Starting earlier than in previous editions, riders may ride further than Loudeac for their first sleep stop ... if they consider sleeping at all! But the need to sleep can show up all of a sudden. Saint-Nicolas-du-Pelem should allow riders to tackle this stage without worries. Located midway between Loudeac and Carhaix, it will offer an ideal sleeping opportunity for riders hesitant to ride all the way to the next control. In addition to many sleeping mats, there are: showers - restrooms - cold and hot snacks (breakfast) - and a bike mechanic. Previous PBP finishers will tell you how strange it is to look forward to Brest for many hours and finally see only a few corners of the city. In 2011, riders will be forced to discover a little more of Brest's assets by riding along the port and in the city centre. The goal is for your arrival in Brest to become one of the greatest memories of your randonnee. Since 2007, French law has changed and all riders must wear a high visibility vest during hours of darkness or other low-light conditions. Long before it became compulsory in France, the ACP mandated the wearing of a reflective sash when riding at night. In 2011 , all reflective vests must comply with the safety norm no. EN471. At registration, riders can purchase a reflective vest, to ensure compliance with French traffic law. This vest will be marked with the PBP Randonneur 2011 logo. Thanks to Mark Thomas for providing this digest. Just in case you don't follow, don't have time to follow, or simply aren't aware that you should be following, Ed Felker and company (Jon Gardner & Mary Gersema) are posting results of the latest TDR photo contest during the week of January 21. There are quite a few familiar faces and places among the entries. You can check out all the photos and results of the judging at The Daily Randonneur. 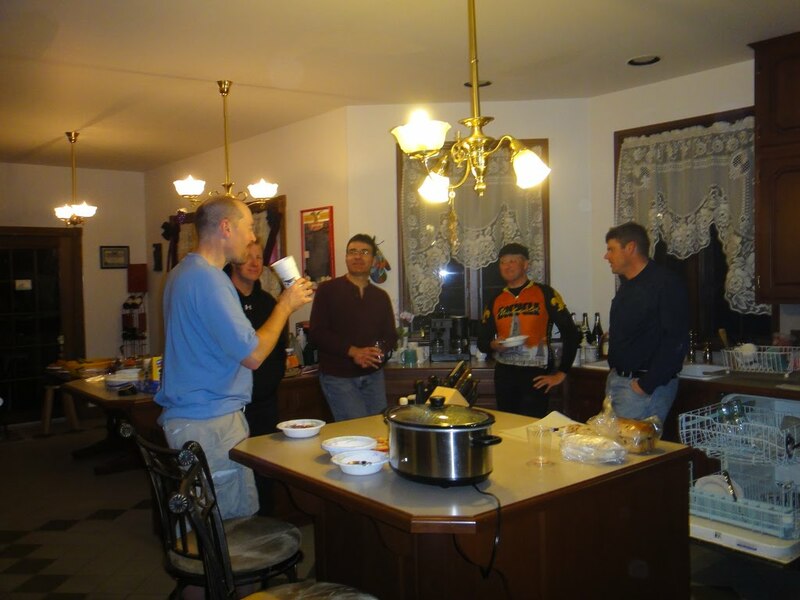 Congratulations to Shane Beake for his runner-up finish in the Spirit of Randonneuring category with his picture of the 2010 Cyclepath fleche team warming up at the Quakertown Hostel following a very wet 24 hours. Additional photos taken by Mark Kaufman during our New Years Day Brevet can be accessed from my FLICKR Account for your viewing pleasure - thanks Mark! While I know there are a few among us leading charmed lives that never encounter bad weather while riding brevets. I've never been much for charm and have wished on more than a few occasions for a little more water-proofness from my clothing. RUSA has come to the rescue. For a limited time, RUSA members can order a RUSA-branded Showers Pass jacket at a special discounted price. The Showers Pass Elite 2.0 is one of the best rated rain jackets available, drawing rave reviews from the kings of wet-weather randonneuring, Seattle International Radonneurs. The Double Century jacket is lighter weight and packs into a smaller package. Additional details and ordering instructions are available on the RUSA website at: http://rusa.org/ShowersPassOffer2011/. The order deadline is January 31, 2011 so don't wait too long.